A few days ago I posted a picture of the Bigjigs Fairy Figure of Eight Train Set on my Instagram which we bought for Emme's first birthday and everyone seemed to love it, so I thought that with Christmas very quickly creeping upon us, it was time that I reviewed it! I adore wooden toys and seem to have made it my mission to ensure Emme has as many wooden toys in her playroom as possible! 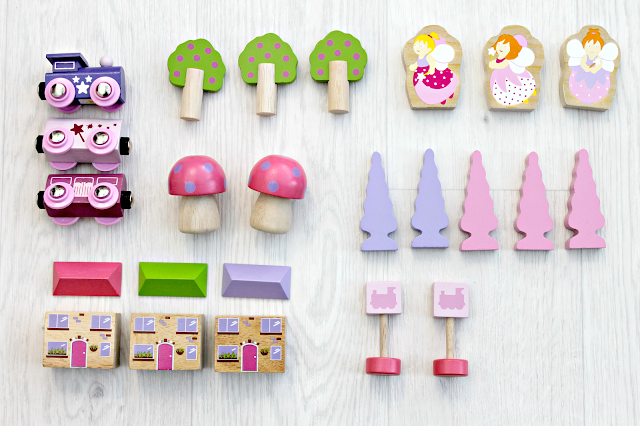 Although some of the wooden toys that we have bought for Emme are a little too old for her yet, I love that wooden toys grow with your child! Not only that but the quality ensures that they will last for so many years to come and they also encourage your children to use their imagination! Emme has only recently taken a great interest in her wooden train set but she is already getting so much enjoyment from it and I only hope this will grow as she becomes older and starts to fully understand the toys that she is playing with and learns to use her imagination. I love how Emme gets excited every time I wedge a fairy between the train carriages, that she loves to help push the train over the bridge and she gosters with laughter each time the train falls off the track! Watching her play with wooden toys gives me that warm fuzzy feeling, I guess its because it feels very nostalgic to me, it reminds me of being a child and using my imagination, it makes me feel so proud and it makes us both so happy! If there's one thing I want to encourage Emme to do, it's to become fixated on her toys and not electronics! Being a train driver Dan was adamant that Emme was having a train set for her first birthday and I thought it was so sweet when he found her this one, he originally wanted to buy her the Bigjigs Fairy Town Train Set but I don't think that she would appreciate that one until she's a little older. Bigjigs is a family operated business which was founded in June 1985, their mission is to 'deliver quality, safe and affordable products which are responsibly sourced and complement childhood fun, exploration and learning.' 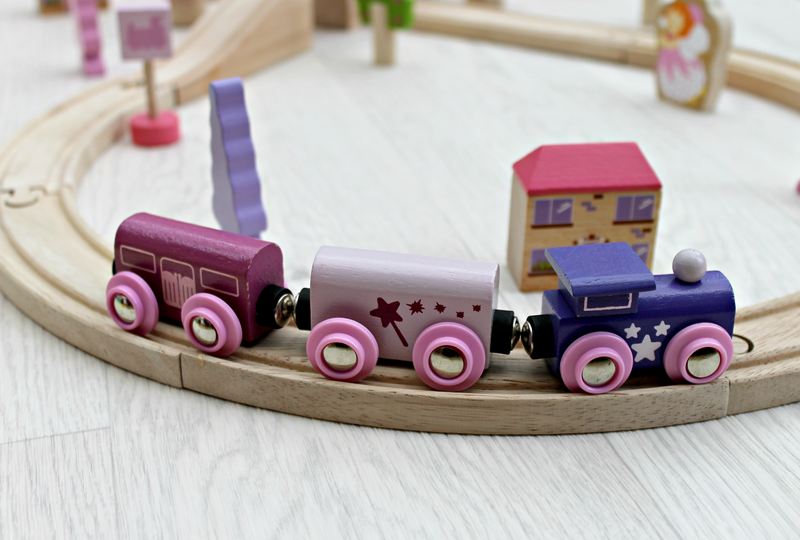 They have a variety of amazing toys which encourage creativity and imaginative play, making them a great company to start your child's wooden collection. 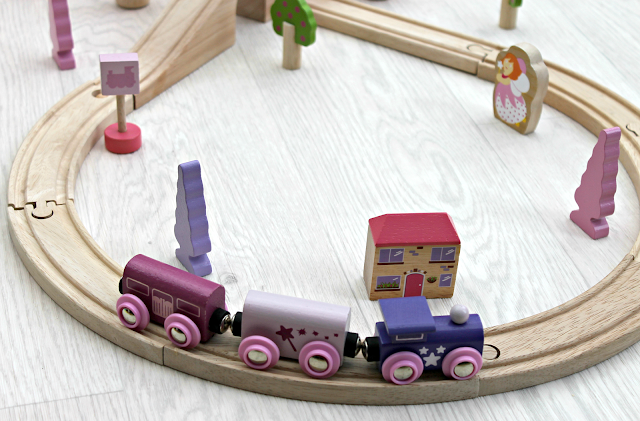 The quality of this train set is fantastic, the wood is sturdy, and the pieces fit together well. The designs on the accessories are perfect and it is very easy to put together, even without instructions (i'm pretty good at losing them,) It has so far survived many drops, water spillages and Emme treading all over it, I could not be happier with our purchase. The Fairy Figure of Eight Train Set consists of 40 pastel play pieces, including a train, two carriages, trees, houses, fairys and toadstools, with additional accessories available to purchase to expand your collection, we will most definitely be expanding Emmes for Christmas, however it is also compatible with most other major wooden railway brands. This train set is for ages 3+ so we only allow Emme to play with this in the presence of either Dan or myself. 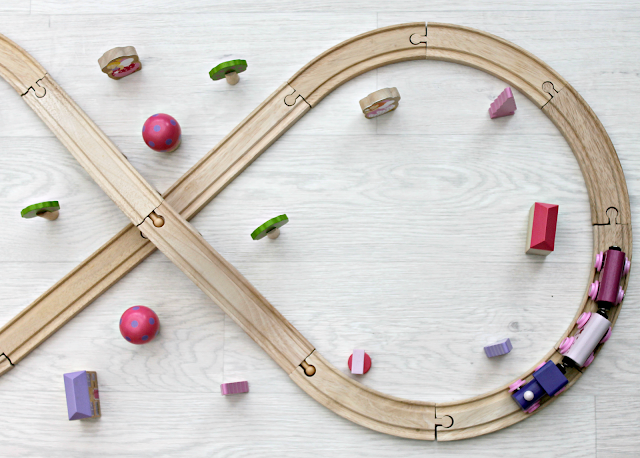 You can purchase the Fairy Figure of Eight Train Set here for £22.50 from natural baby shower and if you sign up to their emails, you will recieve 10% off! Have you tried anything from Bigjigs? Will this be going on your childs Christmas list?